Dental Implants are the perfect solution for patients with missing teeth. There are several ways to restore your missing teeth. The first option is to have a removable denture which many patients find inconvenient and uncomfortable. The second option is to have a dental bridge if you have healthy teeth either side of your missing tooth. The third option is to have a single Dental Implant. If you have several teeth missing in a row and the gap is too wide to ensure the strength of a Dental Bridge you can have several Implants spaced out and a permanent bridge is fixed to your Implants ensuring it is strong. Dental Implants effectively act like your own natural teeth. An Implant is a artificial tooth root made of titanium which intergrates with your bone to ensure its longevity. A Dental Implant should be with you for life so it is a permanent solution for patients with missing teeth. Titanium is designed to integrate with human bone. A process also known as Osseointergration. 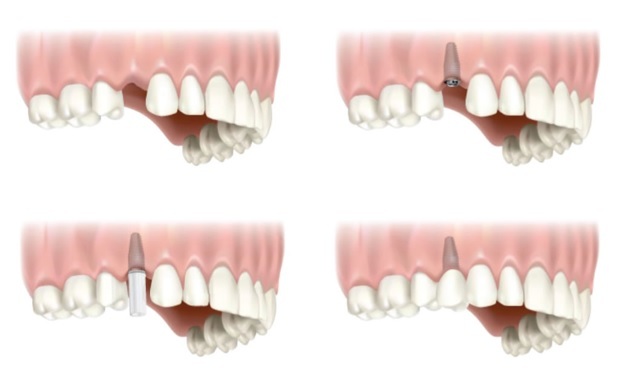 If you have a single missing tooth or a single tooth which is no longer healthy and is in need of extraction you can choose to have a Dental Implant to replace your missing tooth. The Implant will be as strong if not stronger than your original tooth. The result is a porcelain tooth that appears very natural. The only other alternative is to have a 3 tooth Dental Bridge. If you have multiple teeth missing we do not replace every missing tooth with a Dental Implant. It is impossible to replace 28 teeth with 28 Implants as the bone would not successfully hold that number of Implants. An an example, if you have 4 teeth missing in a row the Surgeon will place 2 Dental Implants which will support a 4 tooth Dental Bridge. If a patient is missing all their teeth on a single jaw (upper or lower) we usually place 6 Dental Implant and attach a Dental bridge consisting of 12-14 Crowns. A full mouth reconstruction is double the amount of Implants (12) and Crowns (24-28). 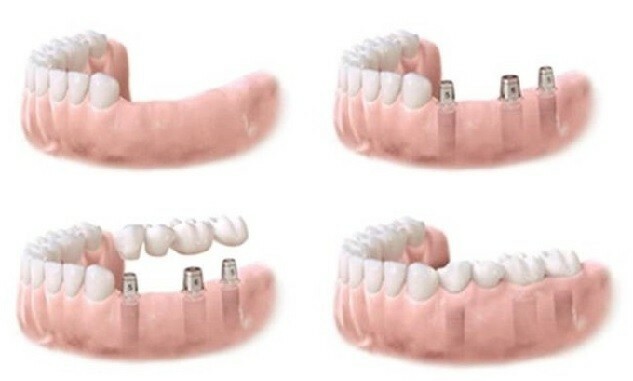 If you only have a few teeth missing in a row and your teeth eitherside of the gap are healthy you also have the alternative of a Dental Bridge. A Dental Implant and Crown consists of 3 parts. 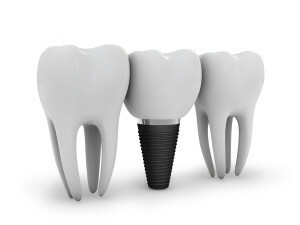 The Dental Implant (also known as the titanium screw), the Abutment (the small attachment that connects the Implant and Crown) and the Crown (artificial tooth) itself. The cost of our Dental Implants also includes the cost of the Abutment. Some dental clinics separate the costs and quote a price for the Implant Only and a further price for the abutment. Since 2009 we have seen a consistent rise in the number of patients requesting Dental Implants in Fethiye. In fact over 400 more enquiries for Implants were seen in 2013 compared to 2009. Dental Implants are the most natural way of replacing your natural teeth. They feel very natural as they intergrate with your jaw bone in a similar way to your natural teeth. If you are missing natural teeth for a long period of time your jaw bone will start to reduce, this affects the strength of your jaw bone and your face can look a lot thinner. Dental Implants ensure your jaw bone is preserved and prevents gradual bone loss. Dentures are neither a comfortable or practical solution for missing teeth. A Dental Implant is very practical and will restore your dental function to what it was when you had natural teeth.